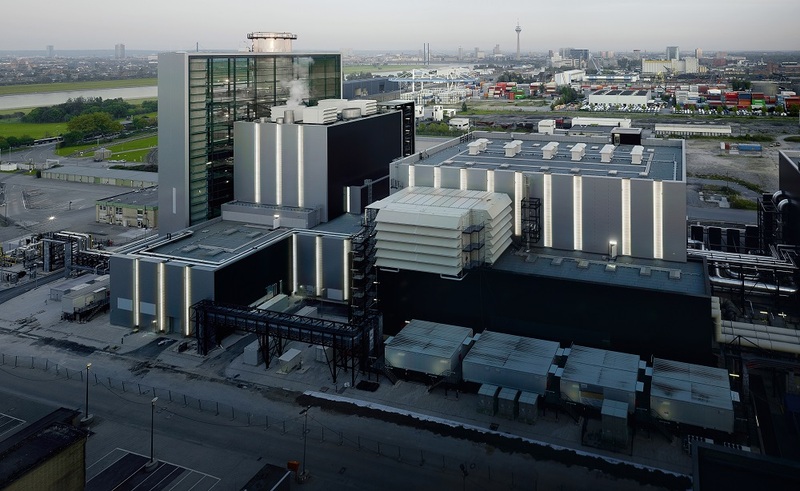 Munich and Erlangen, Germany - January 28, 2016 - The "Fortuna" combined cycle gas turbine (CCGT) power plant at the Lausward location in the port of Düsseldorf was successfully handed over to the customer and operator, the Stadtwerke Düsseldorf public utility company, on January 22, 2016. The power plant has broken three world records: in the acceptance test a maximum electrical net output of 603.8 megawatts (MW) was achieved and the net energy conversion efficiency was around 61.5 percent. 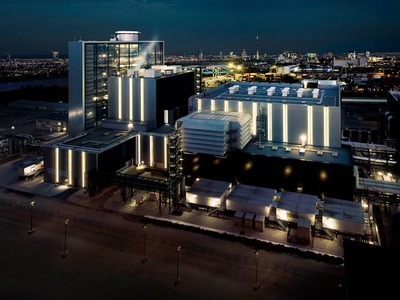 In addition, "Fortuna" can also deliver up to around 300 MW for the district heating system of the city of Düsseldorf - a further international peak value for a power plant equipped with only one gas and steam turbine. This increases the overall efficiency of natural gas as a fuel to 85 percent. The heart of the "Fortuna" CCGT power plant is the extremely powerful SGT5-8000H gas turbine from Siemens. Highly efficient and flexible CCGT power plants ideally complement renewable energy sources such as the wind and the sun, which are subject to fluctuations in their power outputs. High efficiency and low CO2-Emissions. With the cogeneration of district heat, fuel utilization for the unit "Fortuna" at the Lausward is boosted up to 85 percent, while the specific CO2 emissions are reduced to a mere 230 grams per kilowatt-hour. Because of the plant's close proximity to the downtown area of the city, special importance was attached to minimum emissions, optical integration into the cityscape, and lowest achievable noise levels. 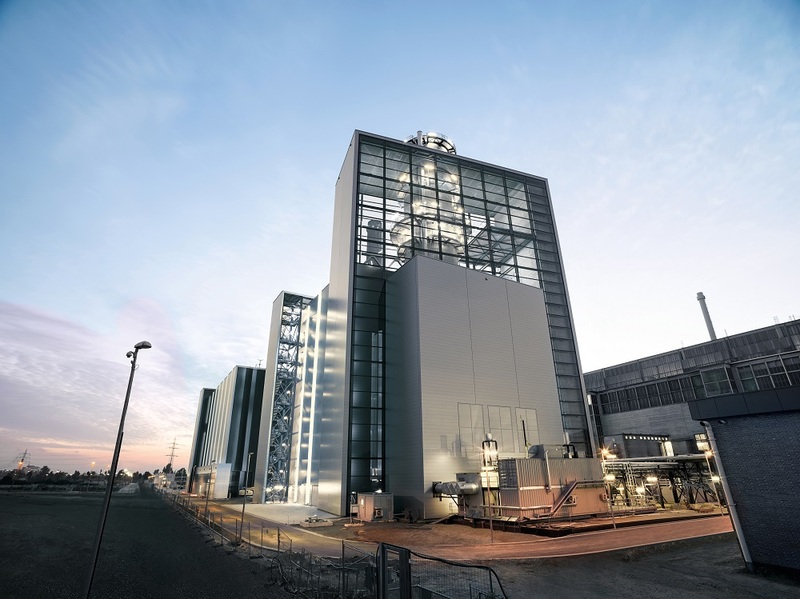 On January 22, 2016, Siemens handed over the combined cycle power plant equipped with a Siemens H-class gas turbine at the Lausward location in the Düsseldorf (Germany) harbor area to the customer and operator, the utility company Stadtwerke Düsseldorf AG. The turnkey plant sets three new records in world-wide comparison. During the test run before acceptance, unit "Fortuna" achieved a maximum electrical net output of 603.8 megawatts (MW), which is a new record for a combined cycle plant of this type in a single-shaft configuration. A new world record of around 61.5 percent for net power-generating efficiency was also achieved, enabling Siemens to beat its own efficiency record of 60.75 percent set in May 2011 at the Ulrich Hartmann power plant located in Irsching in the south of Germany. The high efficiency level makes the power plant especially environmentally friendly. Combined cycle power plant at the location Lausward in Düsseldorf. On the 22 of January 2016 the unit "Fortuna" of the combined cycle power at the location Lausward at the Düsseldorf harbor was committed successfully to the customer and operator, the utility company Stadtwerke Düsseldorf. The key component of the plant is the efficient SGT5-8000H gas turbine from Siemens. In addition, unit "Fortuna" can also deliver up to around 300 MW for the district heating system of Düsseldorf – a further international peak value for a power plant equipped with only one gas and steam turbine. This boosts the plant's fuel utilization up to 85 percent, while reducing CO2 emissions to a mere 230 gram per kilowatt-hour. The increase in the capacity and efficiency levels is the result of consistent ongoing developments, for example in the design of components, in the materials used, in the overall construction of the plant, and in the perfect interworking of all plant components. 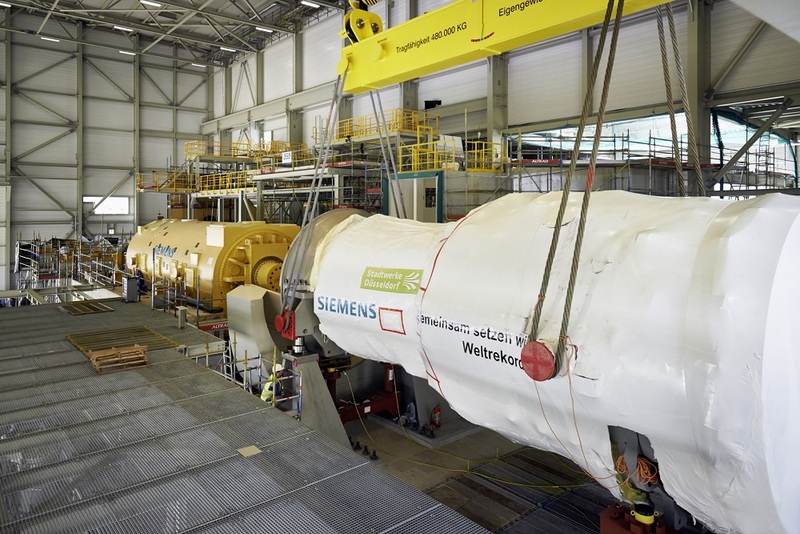 Siemens wins three world records with the unit "Fortuna". 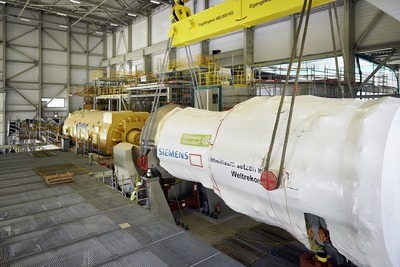 Siemens sets three new world records at the unit "Fortuna" in the combined cycle power plant at Lausward. The installed Siemens power plant technology reaches efficiency for net power generation of around 61.5 percent, achieves a peak electrical net output of 603.8 megawatts (MW) and can supply around 300 MW of heat for district heating. "We optimized the power plant to enable it to be ideally positioned in one of the world's most demanding power markets. 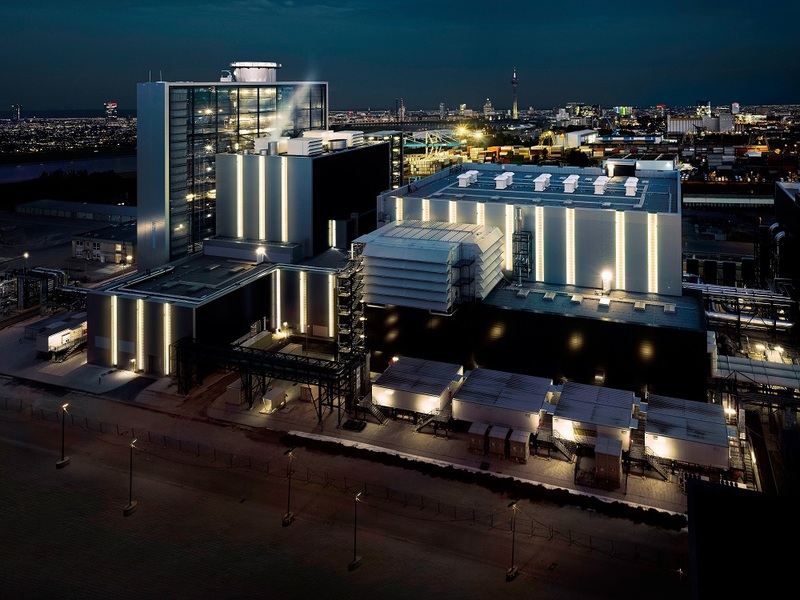 Together with the Stadtwerke Düsseldorf we are therefore very pleased that this plant set the new efficiency world record," stated Willi Meixner, CEO of the Power and Gas Division within Siemens AG. The gas turbine can run at full load in less than 25 minutes after a hot start, enabling it to also be used as a backup for renewables-based power production. The installation of the SGT5-8000H gas turbine. In the machine hall of the unit "Fortuna", the SGT-8000H is deployed on the foundation and connected to the generator. 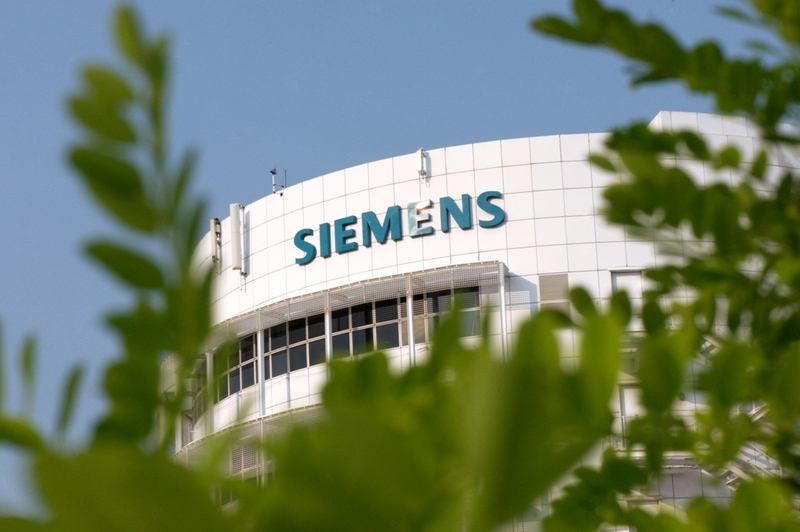 To date Siemens has 76 H-class gas turbines under contract worldwide. This flexibility supports the operator in efforts to achieve economical operations in a challenging environment for conventional power plants. Unit "Fortuna" was handed over to the customer 19 days ahead of the date set in the contract. The project on the bank of the Rhine was additionally a huge success with regard to occupational safety for everyone involved. More than two million hours of work in total were performed without a single accident. Because of the plant's close proximity to the downtown area of the city, special importance was attached to minimum emissions, optical integration into the cityscape, and lowest achievable noise levels: On the opposite shore of the Rhine, across from the plant, the noise level is less than 25 decibels – quieter than a whisper. Construction of H-class CCPP Düsseldorf power plant proceeding according to plan. 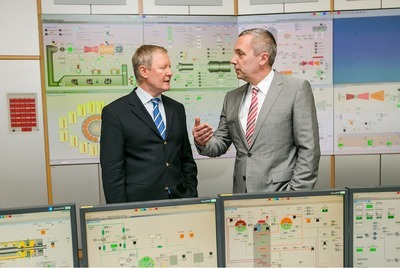 From left to the right: Lothar Balling, head of the Project Management business unit in the Siemens Power and Gas Division and Udo Brockmeier, chairman of the managing board at Stadtwerke Düsseldorf in the central control room. With 17 units in commercial operation, the SGT-8000H fleet has already reached more than 195,000 hours of operation. In terms of the average emissions of power generation for all coal-fired power plants throughout the European Union, a natural-gas-fired combined cycle power plant such as this one, with an electrical efficiency of 61.5 percent, theoretically saves approximately 2.5 million tons of carbon dioxide (CO2) annually. This corresponds to the amount of CO2 emitted by 1.25 million passenger cars, each driving 15,000 kilometers a year. Transport of the gas turbine SGT5-8000H from the gas turbine manufacturing facility to the Charlottenburg Canal. Final steps in the gas turbine manufacturing plant shortly before the start. Siemens AG (Berlin and Munich) is a global technology powerhouse that has stood for engineering excellence, innovation, quality, reliability and internationality for more than 165 years. The company is active in more than 200 countries, focusing on the areas of electrification, automation and digitalization. 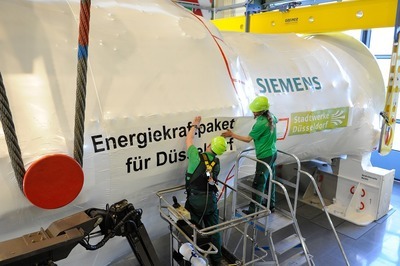 One of the world's largest producers of energy-efficient, resource-saving technologies, Siemens is No. 1 in offshore wind turbine construction, a leading supplier of gas and steam turbines for power generation, a major provider of power transmission solutions and a pioneer in infrastructure solutions as well as automation, drive and software solutions for industry. The company is also a leading provider of medical imaging equipment – such as computed tomography and magnetic resonance imaging systems – and a leader in laboratory diagnostics as well as clinical IT. 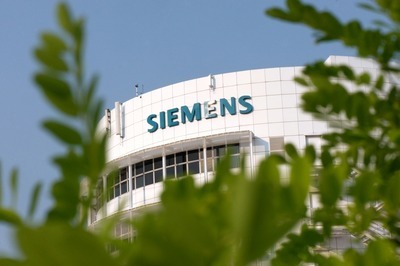 In fiscal 2015, which ended on September 30, 2015, Siemens generated revenue of €75.6 billion and net income of €7.4 billion. At the end of September 2015, the company had around 348,000 employees worldwide.